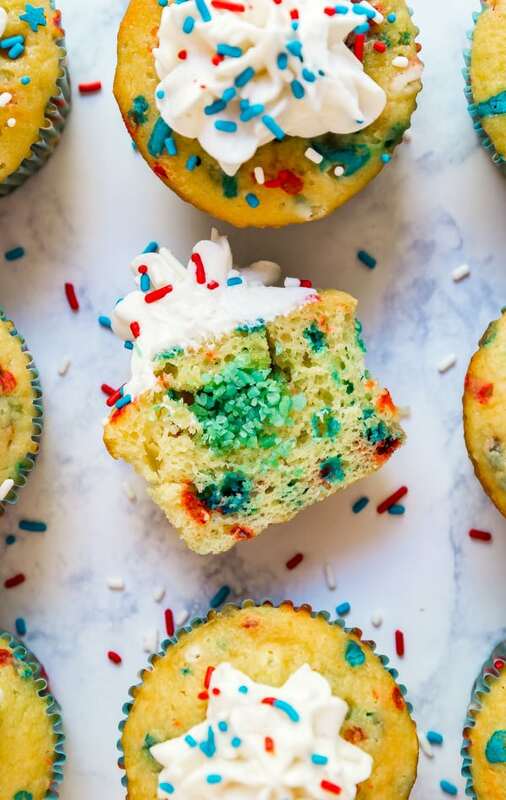 Firecracker Vanilla Cupcakes are the most fun kid’s dessert the 4th of July- you’ll love the POP ROCKS hidden inside for a totally fun surprise when you bite into them. These are a must-make and are SO easy! These cupcakes have been on my must-make list of about a year. I dreamed them up last year, right around 4th of July, but decided to hold off until this year. I knew I wanted to make something patriotic. And a filled cupcake seemed like a good way to go, specifically when I started really digging in and thinking about the theme. Because when you think about Independence Day and your activities for the day, fireworks immediately come to mind. And when I think fireworks, I think of loud cracks and pops (although perhaps that’s because T is in a phase where she’s terrified of fireworks and T and I spent her first Disney World fireworks browsing the gift shops!). With this in mind, I knew pop rocks would be the perfect way to add a fun surprise when people bite into it! 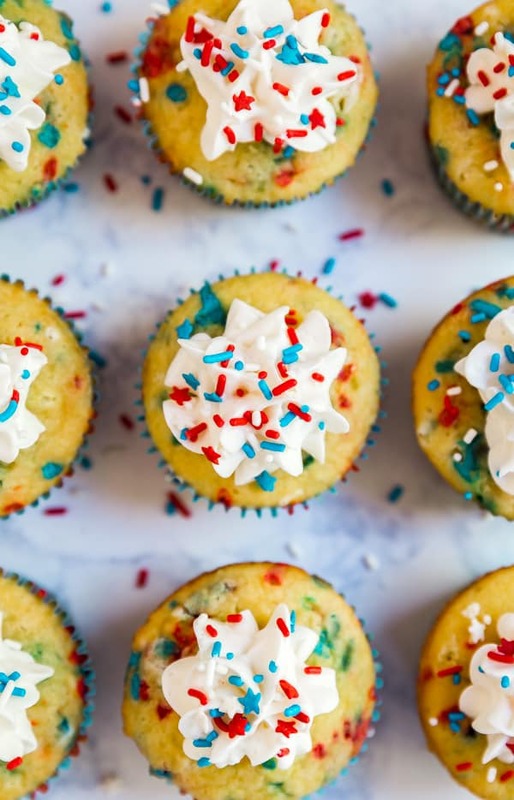 I used a variation of my absolute favorite cake mix hack because it’s the most perfectly moist vanilla cupcake recipe that you’ll ever taste. And I opted to make these funfetti cupcakes to make them even more fun. 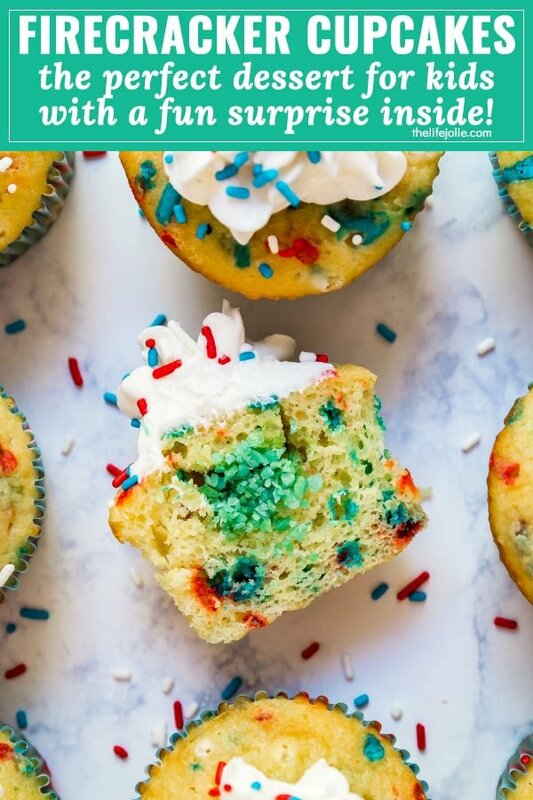 Because who doesn’t like funfetti, amirite?! Don’t over mix the batter! Stop the mixer when the batter is almost fully mixed and then gently fold in the sprinkles. If you have extra large eggs on hand, use those for even lighter and fluffier cupcakes. If you don’t like almond flavor (or can’t have nuts) feel free to swap that out with whatever flavor extract you prefer. I love using a cookie scoop for this because they’re also great for quickly and easily filling muffin cups evenly. The scoop I used holds 3 tablespoons of batter. Highly recommend! I find that the easiest way to hollow out the cupcake is to use the wide side of a pastry tip . Only bring it down so that half of the is covered. You can also use a knife. Either way don’t go too deep and try to keep the piece you’re taking out in one piece so you can put it back in once the pop rocks are in. Speaking of Pop Rocks , make sure you put them in shortly before serving as they’ll lose their pop if they sit too long. I chose to keep a lighter hand on the frosting- this is more of a personal preference, but if you prefer more, just pipe more on. 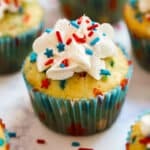 Firecracker Vanilla Cupcakes are the most fun kid's dessert the 4th of July- you'll love the POP ROCKS hidden inside for a totally fun surprise when you bite into them. These are a must-make and are SO easy! In a large bowl beat together cake mix, pudding mix, water, oil, eggs and almond extract until just combined. Stir in sprinkles. Fill the muffin cups with 3 Tablespoons each of batter (or use a medium cookie scoop). Bake 15-20 minutes and cool completely. 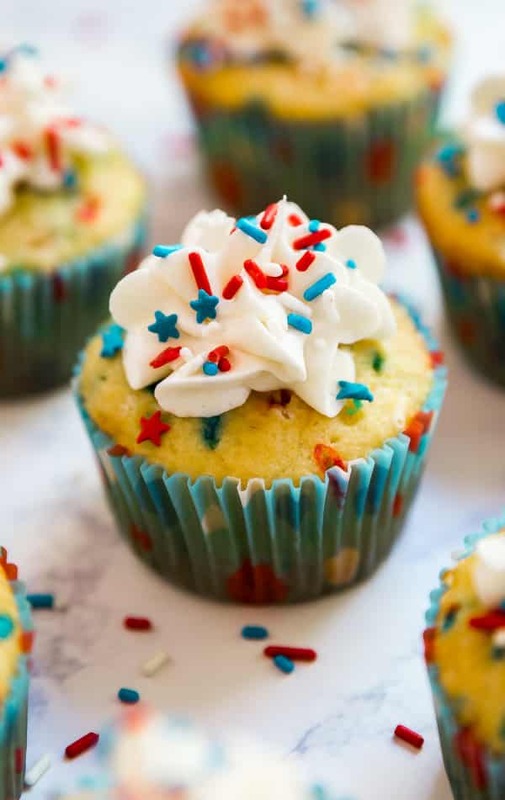 Use the back of a pastry tip to remove about an inch of the cupcake top. 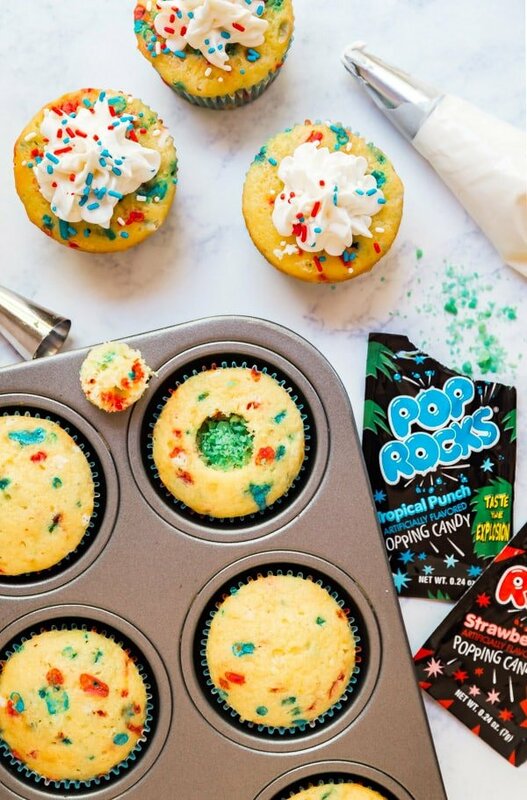 Just before serving, pour 1/2 teaspoon of Pop Rocks into the hole and return the piece of cupcake into the hole to close it. Pipe dabs of frosting on top and finish with a few more sprinkles. 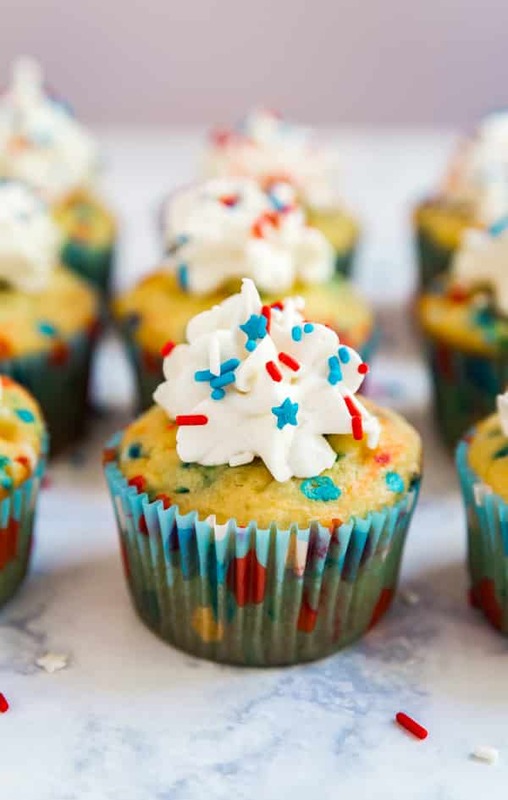 Looking for some other easy cupcakes recipes? 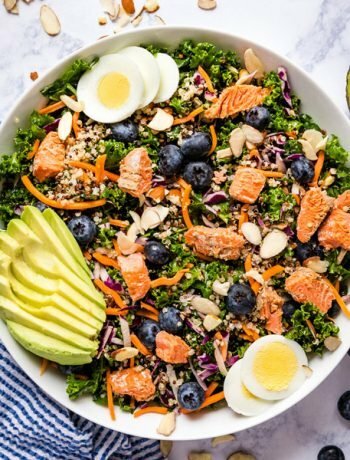 June 27, 2018 at 4:52 pm These look great!! I have to try them. June 29, 2018 at 8:25 pm Wow, love these colorful and cute cupcakes! June 30, 2018 at 4:39 pm Thanks Richa!